Boost your sales productivity while increasing the flow of great contact data into your Salesforce CRM with ScanBizCards Enterprise. With unlimited options for organization-specific data customization and full admin control of lead flow, ScanBizCards Enterprise offers a simple, unique solution for getting new contacts into your funnel as quickly as possible. Assign lead owners and campaigns to new contacts/leads before exporting them to Salesforce. 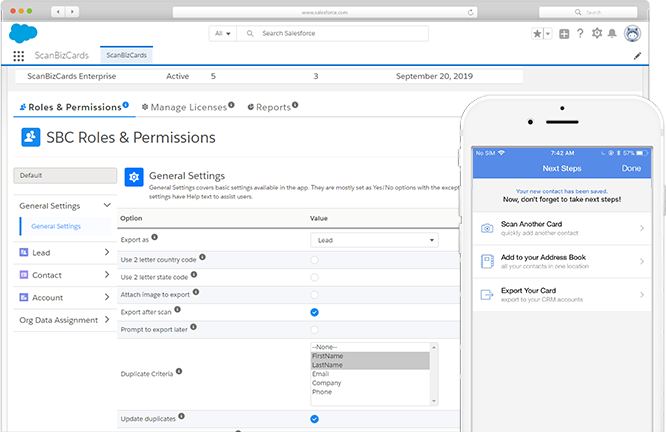 Your admin panel offers custom control over all associated apps used by your sales reps. Easily attach contacts / scans to new or existing customer accounts. 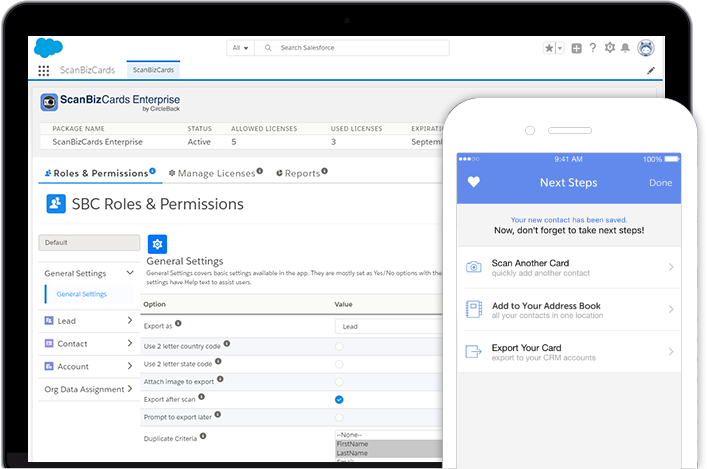 Export multiple cards to Salesforce simultaneously in an easy, seamless experience. Rest assured that ScanBizCards Enterprise prevents the import of pre-existing contacts in your Salesforce records. Customize any / all captured fields to your organization’s needs. Admins can view business card scans, email signature capture and user activity reports. Capture and save email signatures to your address book and export them to your Salesforce CRM. Send your scanned business cards for manual transcription for hard-to-read cards. Need more than 1000 users? We’re ready to help. Drop us a line.